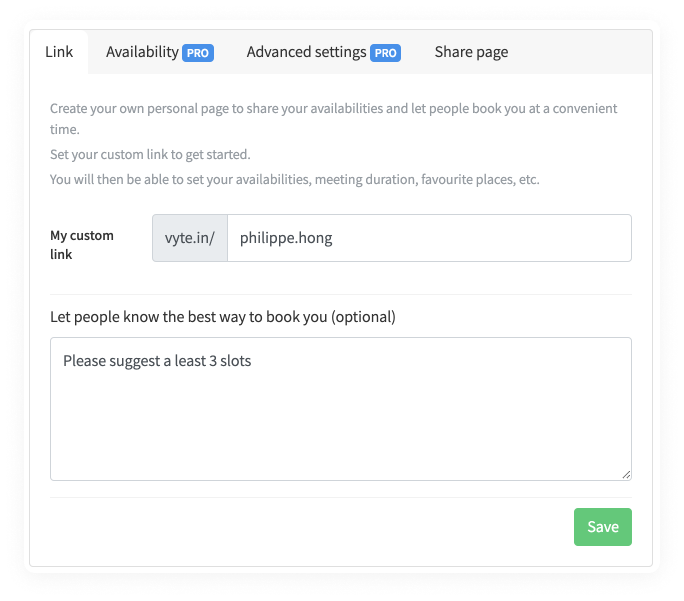 You will be able to choose a personal Vyte Page link that you can share with clients and colleagues. A Vyte Page link is unique so grab yours quickly! To create a Personal Vyte Page link, it's super easy. You'll then jump to your Vyte page settings. In the first page, you'll be able to choose your Vyte Page URL. Your Vyte Page is unique so first come first served. There is a lot of more features like Availabilities, Advanced settings and Sharing features. Add buffer time in your bookings and set how much time before and after each meeting people can book you. Hide invitees from each others when scheduling a meeting is a powerful feature when scheduling with a group of people or for recruiting. Time Zone handling is a powerful feature of Vyte to help detect the time zone of your invitees and show the specific infos for a better scheduling.